Land’s End is not only the end of land at the edge of the sea, but the edge of everything we stand on. It is a precipice, a cliff, the opening of the abyss. The ocean’s edge is land’s end, but then that is also something primordial, what we have crawled out of, the depths of our beginning, the deep within us. It is a metaphor for the soul, a metaphor for the unconscious. History and time are not rivers, but oceans . . . There is an emotional vertigo when faced with the sea . . . we are calmed and thrilled at the same time-but then horrifically, there is supposedly a moment of calm right before death when drowning-the edge of the known and the unknown. This is Land’s End. 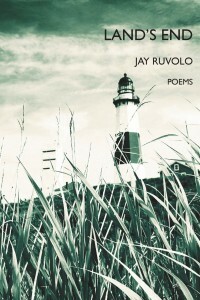 Jay Ruvolo. Poet. Thinker. Teacher. Human. Publishing Editor of The Falling Leaf Review, fallingleafreview.org. Lives in New York City.